Lewis Shaw, chairman of the company, said it will take time to work out a permanent agreement and he wanted to give rafters a chance to begin their season. “While mediation between Jackson-Shaw and the two Taylor River rafting companies continues, Jackson-Shaw recognizes that Three Rivers and Scenic are at the threshold of their commercial rafting season and that it will take time to finalize any formal agreement. Accordingly, as a show of good faith, Jackson-Shaw has decided to give Three Rivers and Scenic permission to float through Wilder on the Taylor this summer,” Shaw said. Bob Hamel, chairman of the Colorado River Outfitters Association, said it was a nice gesture but rafters believe they don’t need Shaw’s permission to raft the river. 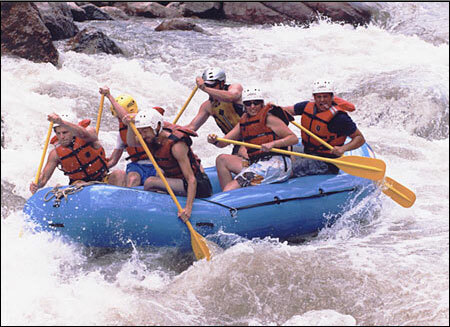 Rafting companies were already going ahead with their new season, he said. “Jackson-Shaw is not entitled to grant permission. The permission is in the Forest Service permit. I think this is premature because we’re still in negotiations,” Hamel said. Rep. Kathleen Curry, an unaffiliated state representative from Gunnison, said she believes voters will side with rafters, who have exercised their rights to use Colorado rivers for decades and have become a symbol of Colorado’s outdoor life. Eric Anderson, who represents a coalition of property owners, including fishermen who barred rafting this year on their property, said he believes fishermen will win in the court of public opinion because their property rights are being threatened. Jackson-Shaw won’t allow rafters to fish the Taylor through the preserve, but they can portage a bridge (go around on land) as long they are “respectful” of the property, and the boaters must also limit the number of trips and stick to certain times and dates. “We believe that these rules are reasonable and will allow the rafting companies to meet demand, operate profitable businesses, and conduct far more commercial trips through the property this summer than last summer,” Jackson-Shaw Chairman and CEO Lewis Shaw said in a release. More HB 10-1188 coverage here. More 2010 Colorado elections coverage here. The Consitution allows fishing through this section. Fisherman do not need Mr. Shaw’s permission.